The lens features a versatile focal length and a constant f/2.8 aperture making it suitable for a wide range of photographic applications, including sport, travel, wildlife and night time photography. The lens is also equipped with the world’s first Triple Linear Motor, which uses an inner focusing system to maximise portability and ensure AF operation is quick, smooth and quiet. 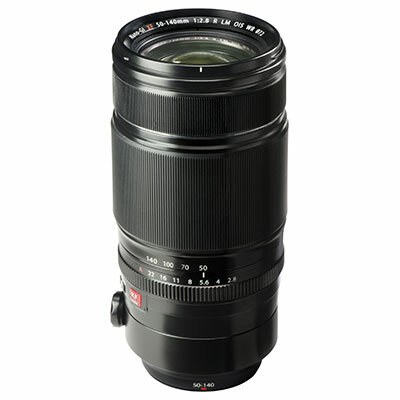 As with other Fuji XF lenses, the 50-140mm offers an all-metal barrel construction and an aperture control ring. To deliver the best image quality in its class, this luxurious telephoto zoom uses an optical construction comprising 23 glass elements in 16 groups, with five ED lens elements and one Super ED lens element comparable to a fluorite lens. This maximises the reduction of chromatic aberrations and delivers high resolving power. Applying Fujifilm’s unique HT-EBC (High Transmittance Electron Beam Coating) to the entire area of the lens surface ensures ghosting and flare are controlled for sharp, clear images. Also, using the newly developed Nano-GI (Gradient Index) coating technology, which alters the refractive index between glass and air, ghosting and flare are effectively reduced for diagonal incident light. An inner zooming mechanism means the lens does not change length so the lens’ balance remains the same throughout the zoom range. By combining this lens with an X Series camera body*3 with Lens Modulation Optimiser*2 (LMO) technology, the performance from the lens is improved even further. LMO corrects for diffraction*4 to produce images with edge-to-edge sharpness and create a realistic three-dimensional effect, even at small apertures. the Triple Linear Motor at intervals of 120°, high-speed, quiet AF is possible. Faster AF is possible when by combining this lens with an X Series camera body offering Phase Detection AF. Combined with the near-silent shutter sound, photos can be taken unnoticed in quiet locations. As AF operates using a signal from the imaging sensor, extremely high-precision focusing is possible. With a minimum working distance of 1m for the entire zoom range, this lens is also great for close ups. Thanks to a high-performance gyro sensor and unique algorithm that cancels drift due to temperature changes, the XF50-140mm delivers the best image stabilisation performance in its class. Combined with a bright F2.8 aperture, handholding is now possible in new areas for a telephoto zoom. 4) Weather resistant, dust-resistant and freezeproof to -10°C low-temperature operation. By applying seals to each portion of the barrel, the lens is weather-resistant, dust-resistant and -10°C low-temperature operation, making it the perfect companion for the X-T1, which has the same levels of protection. 5) High build quality and comfortable operation. Both the focus and aperture rings are metal, plus metal is also used on the exterior of the lens body for a high-quality finish. Thanks to long-term experience and broaden know-how for other top-end professional lens fields such as Broadcasting and CinemaScope, the texture and torque on the rings makes for comfortable shooting even for delicate manual focusing. The lens mount is made from brass for improved strength. Combined with a camera body, the lens is approximately 60% of the weight of a full-size system*6, considerably reducing the burden on the photographer. *2 Fujifilm's own image processing function that corrects the optical effects of diffraction, based on the optical performance of each lens. *3 Supported by the “FUJIFILM X-T1” and “FUJIFILM X-E2” as of August, 2014. *4 Phenomenon that occurs when the shooting with a narrow aperture in which fine images that should originally be sharp become blurred. *5 Method for moving the small lenses in the middle and rear sections of the lens, without moving the large lenses composing the front of the lens. *7 A function allowing seamless manual focusing by rotating the focus ring while pressing the shutter halfway during AF lock. A firmware upgrade is required for the camera body in order to use this function. (Applicable models: X-Pro1/X-E1/X-E2/X-T1).